A well known name in the art world, S.U.N.A.INA, Society for Upliftment of National Arts of India, is dedicated to the cause of propagation and promotion of our traditional Indian art forms. S.U.N.A.INA hosted for the second year in running, Bal Kala Utsav 2012 – a national level exclusive festival – for children, by children and of children, on the 2nd, 3rd and 4th of November 2012 at the Delhi Tamil Sangam R.K. Puram New Delhi. BAL KALA UTSAV is the brainchild of Guru Smt. Kanaka Sudhakar, renowned Bharatanatyam and Kuchipudi exponent, choreographer, teacher and also a research worker on the therapeutic and beneficial effects of Indian classical dance forms on the development of the mind and body of a girl child. 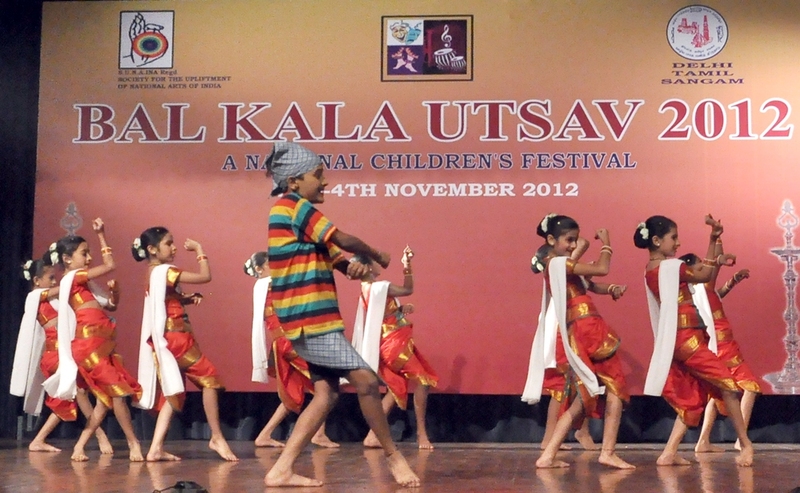 Conceived with the main purpose of providing a platform to upcoming artistes to showcase their talents, Bal Kala Utsav brings together children from between the ages of 5 and 18 on one platform. With rigorous judging standards, talent in dance, drama and music can be discovered and unearthed to promote those who come out winners. The other participants draw inspiration from such winners and strengthen their resolve to raise their exacting standards. This festival was held in collaboration with Delhi Tamil Sangam as co-host, with sponsorship from ONGC and Sahitya Kala Parishad. Throughout this festival, S.U.N.A.INA extends full hospitality to the guest artistes and makes sure that they are treated with the utmost respect that they deserve, along with warmth and cordiality. The age groups in this festival range from minor to senior – in the categories of solo, duet and group in all the classical dance forms, semi-classical and folk. The music competitions witnessed participation in instrumental rhythmic, melodic and vocal. In the drama category of Indian languages, mono act and one act plays were well appreciated by the audience. Only one year old, this festival in 2012 attracted artistes from such far off places such as Assam, West Bengal, Tamil Nadu, Andhra Pradesh, Karnataka, Gujarat, Maharashtra, and Chattisgarh. The national capital Delhi with its suburbs Ghaziabad, Gurgaon and Noida, was not found lagging as performers from this region also chose to exhibit their abilities in our traditional performing arts. Notable performances were those of J Nandini of Pondicherry, V Saradyuti of Delhi, Vijayalakshmi of Coimbatore, Kirti Kala Mandir groups of Pune, and Radhakrishna Dance classes of Gujarat. Ridhi Gulati an eight year old girl was recognized for her exceptional talent in Tabla and gave a scintillating guest performance. In addition to the above, the participants were immensely benefited by workshops conducted by eminent artistes. On the concluding day, 4th Nov 2012, Guru Padmashree Saroja Vaidyanathan conducted a well attended workshop on the topic “Creativity in Bharatanatyam through Sanchari Bhava”. The three day fest concluded with a grand prize distribution ceremony where hundreds of children sat with bated breath to hear the result of his or her performance in music, dance and drama. Guru Jitendra Maharaj, famous Kathak exponent with his senior disciple and Kathak danseuse Nalini, and the three judges of dance, Uma Poonaccha Bharatanatyam), Kalpana Sharma (Kathak) and Reela Hota (Odissi) gave away the prizes. Kirti Kala Mandir from Nasik and Nrityabharati from Delhi bagged the maximum number of prizes. V. Saradyuti and J Nandini were awarded the NARTANA MANI AWARD in recognition of their consistent progress and exceptional performance in dance over the years. The festival ended with the National anthem. It is the ardent hope of S.U.N.A.INA’s Founder-Director, Guru Smt. Kanaka Sudhakar that this annual festival will gain more popularity among aspiring youngsters to participate and gain recognition in their chosen fields of art.